Double entry accounting is a system of keeping track of a company’s money with many features to detect errors or malfeasance. This type of accounting also presents a clear picture of the activity and value of the company for a given time period. Each transaction in double entry accounting contains two (or more) opposite entries whose totals must be equal. One entry is call “Debit” and the other entry is called “Credit”. Transactions are broken down into five categories: Assets (what you own), Liabilities (what you owe), Equity (Assets less Liabilities, which is the owners’ interest), Expenses (costs during a specified period) and Revenue (receipts during a specified period). The sum total of the Debits and Credits in a transaction, again, must be equal (“balanced”). Modern bookkeeping software will hopefully prevent saving any unbalanced transactions. Entries are dated and/or otherwise coded so they can be tracked. The formula for this system is “Assets = Liabilities + Equity”. 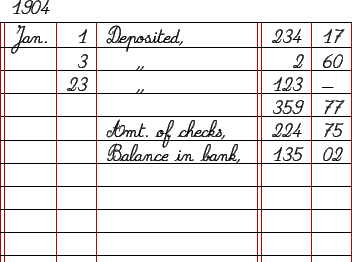 Using this system means that not only is the total of each transaction equal (“in balance”), but the entire system is in balance. This system has been used in some fashion since at least the 11th century. A single entry system breaks down expenses (cash disbursements) and revenue (cash receipts) in software or a cash book and one can manually or electronically keep track of totals. This system does not keep track of assets and liabilities, so does not derive a “net worth” (value of the company). Also, the single entry system is lacking the ability to easily detect errors while detection of errors can be done quickly and easily in the double entry system because a corresponding entry has been recorded which can help to compare and detect errors. Preparation of the profit and loss account cannot be prepared via the information gathered through the single entry system. This means that the single entry system cannot help the firm to determine its financial position over a period of time. On the other hand, the double entry system is useful in the preparation of trading profit and loss accounts. The double entry system helps the business organization to determine its financial position.